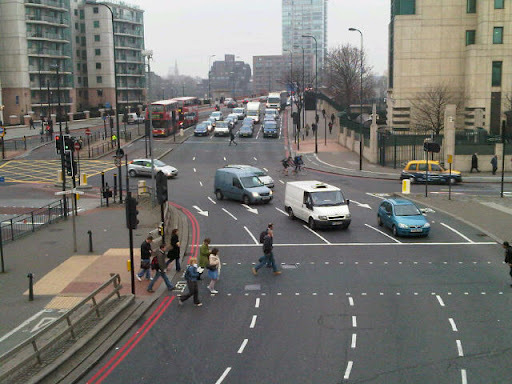 Lambeth Cyclists: Vauxhall Cross: change on the horizon? Vauxhall Cross: change on the horizon? The possibility of making Vauxhall Cross more people friendly has been raised by Transport for London. As you are no doubt aware the current set up of four or five lanes of fast moving one-way traffic does not encourage cycling and the cycle lanes and other measures put in appear to be an afterthought. TfL’s review could lead to reform or even removal of the gyratory system – something for which we have been campaigning for a long time. Consultants employed by TfL are currently studying 21 different proposals for the junction from do nothing to removing the gyratory and returning it to two way working. Pedestrians, local residents, cyclists and others have like Lambeth Cyclists been calling for changes for several years. New building schemes proposed in the area are leading to further pressure to change. The area of course is also set to be crossed by one of the new cycle superhighways. Change is therefore desireable. There is support for removing the gyratory from Lambeth and Southwark London Assembly Member Valerie Shawcross and Lambeth Councillors. Initial findings from the consultants show that there needs to a reduction of around one third of the current motor vehicle journeys to remove the gyratory and provide real priority for people walking and cycling. It sounds a big ask BUT TfL's report on the potential for cycling concludes that 38% of current motor vehicle journeys could easily be cycled. These journeys are short, the people driving are fit and they are not carrying heavy loads. That is not even looking at all the proposed public transport improvements or people reducing the number of journeys they drive. So watch this space as we move towards the London Mayoral and London Assembly elections in 2012. See the presentation that TfL recently made to Lambeth Councillors and officers on its plans for the gyratory at Vauxhall Cross.